After the mixed performance seen in the previous session, the markets continued to show a lack of direction during trading on Thursday. The major averages spent the day bouncing back and forth across the unchanged line. The Dow finished lower with late day selling, and the Nasdaq kept a small gain. At 5:105am ET - Dow futures vs fair value: -107.00. S&P futures vs fair value: -13.00. Nasdaq futures vs fair value: -34.50. Russell 2000 futures vs fair value: -8.50. The pre-markets are showing a down start for the market. With the pre-market drop we will see if 284 still holds or if we see the next support levels of 282 and 280. The MACD lines are slightly positive. The Stochastics are showing overbought. The Money Flow is currently a positive for the market. The 200-day moving average is looking strong and steady. With the stochastics overbought, a light pullback could be expected. I expect at worst the 280 level will hold. The pullback could last 1 day or a few days. However, We are expecting the trend of higher lows and higher highs since April to continue. 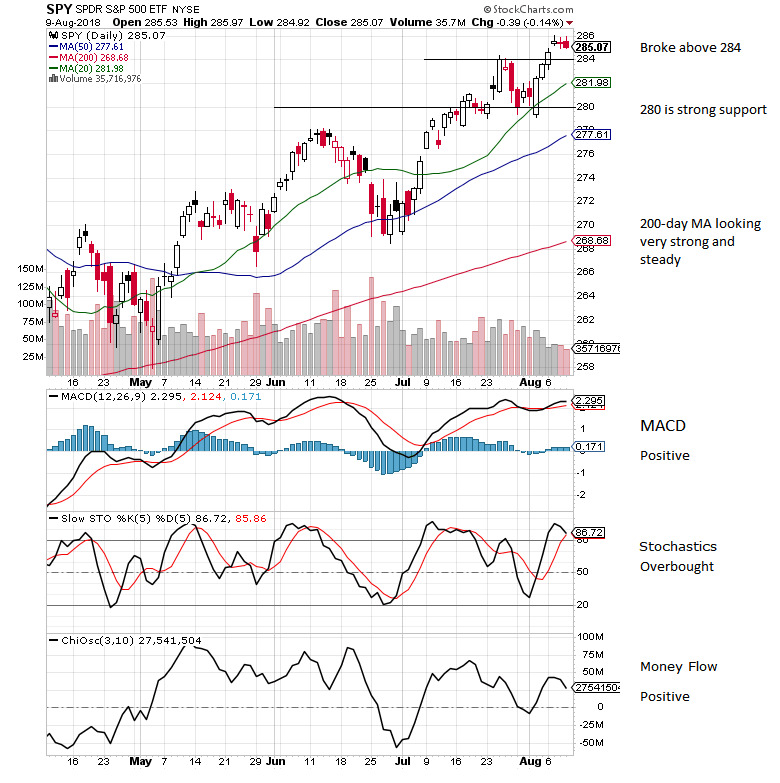 On dips or pullbacks, we may look to add to some positions while keeping an eye out on the trade wars and politics headline risks. In the longer term chart, we have broken above 284. A nice channel featuring higher lows since April has been shown. At worst we expect any pullbacks will not break the channel's lows. Next resistance level is the all-time highs near 287.